Tuques, helmets, crowns, and many more types of hats are part of this theme's workshops, role play suggestions, and arts & crafts ideas. 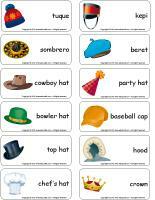 Practice writing the letter H like hat, use the word flashcards to explore many kinds of hats. 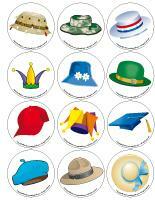 (Open thematic poster-Hats) Print, laminate, and decorate the walls of your daycare with all kinds of posters. 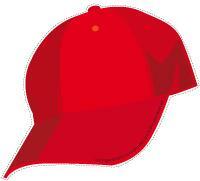 (Open educa-decorate-Hats) Print, cut out, and laminate. Use the illustrations to decorate the daycare throughout the theme. 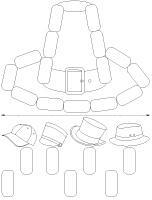 (Open garland-Hats) Print and let children decorate the garland. Cut it out and hang it within your daycare or near your daycare entrance. Hang several different types of hats from the ceiling. This special tool was created in response to a special request received. (Open party hats) Print the various models and assemble them. Let children decorate them using the items on the second page. What kind of hats do we wear in the summer? What kind of hats do we wear in the winter? Which hats are worn to protect our head? When you ride your bike, what do you wear? (Open story and memory game-Hats) Place the cards face down on the table. Children take turns picking a card. Encourage them to tell you who each hat belongs to. I wear it to keep my head warm in wintertime (tuque). I am deposited on a princess' head (crown). It protects a knight's head and I wear one when I ride my bike (helmet). I wear it when I perform magic tricks (magician's hat). Captain Crook wears one on his head (pirate's hat). I wear it to keep my hair dry (swim cap). I am red, black, or yellow and I am worn to put out fires (fireman helmet). I wear it when I go horseback riding (equestrian helmet). I am white and long and I am worn in the kitchen (chef's hat). There are several colourful ones in the circus (clown hat). Cinderella's fairy godmother wears one (fairy hat). Transform your dress-up area to make it a clothing area. For this theme, collect old clothing items: shirts, robes, socks, mittens, scarves, sweaters, belts, hats, tuques, gloves, etc. Ask parents for their help. They will be glad to share items they no longer wear with you. Use cardboard boxes to sort the items by season, style, etc. Hang a clothesline within the daycare. You can, for example, hang different clothing items on it each day. Throughout the week, children will have fun dressing up. Let them mix and match as they wish. You may use the items to help children practice getting dressed for outdoor play, with winter clothing items for example. For older children, give precise instructions. Wear a different hat each morning to greet children. The pictures may be used as a memory game or to spark a conversation with your group. Use them to decorate your daycare or a thematic corner. 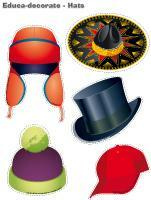 (Open picture game-Hats) Print, laminate, and store in a Ziploc bag or in your thematic bin. (Open educ-poster-Letter S) Print and laminate the poster. 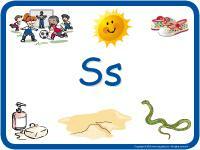 Display the poster and use it to introduce children to the letter. 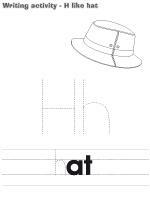 (Open writing activities-H like hat) Print for each child or laminate for use with a dry-erase marker. 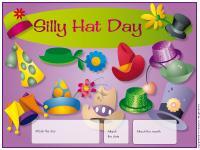 (Open stationery-Hats) Thematic stationery is offered with each theme. Print and use the stationery to communicate with parents, in your writing area, or to identify your thematic bins. Wrap your usual blocks with different types of fabric to offer new textures. Empty spools of thread can be used to make all kinds of original constructions. Stencils which can be used to trace clothing items. Children can also color them. Fabric scraps can be used for a painting workshop. Fabric can be rolled up or twisted and dipped in paint. Yarn can be used for collages or dipped in paint and used to make impressions on paper. White t-shirts (Dollar store) and crayons or paint designed for use on fabric. The kitchen area becomes a laundry room. Use cardboard boxes to make your own washer and dryer (unless you already have toy versions of these appliances). Add piles of clothing. Children will love pretending to do laundry. A toy iron and ironing board can be lots of fun too. Hang a clothesline and offer a large quantity of clothespins. Children will enjoy hanging clothing items. A toy sewing machine or an old machine which no longer works (needle removed). Memory game involving clothing items. You can cut the cards to make them look like t-shirts if you are making your own game. Memory game, lotto game or any other game in which clothing items are found. You can associate a "seasons" theme with "clothing" since clothing requirements vary depending on the season. Modeling dough and cookie cutters representing various characters. Puzzles representing seasons or different sports which require specific types of clothing. Simple weaving activities for children. Books about professions children can look at to explore different types of uniforms and hats. A poster of clothing items can be displayed on the wall of your reading area. Large blankets children can wrap themselves in. A song box filled with song titles related to clothing. A water table, dolls, and their clothing. Children will enjoy washing the clothing and hanging it to dry. Sand box or a bin filled with cereal and characters representing a variety of professions. Dye white fabric (cotton) with different natural ingredients (red cabbage, mustard, frozen blueberry juice, etc.). Print and laminate the word flashcards. Have each child pick one word. One at a time, children present their word flashcard (ex. tuque). Discuss each item and ask your group questions. (Open box sounds and pictures-L and Q) Print the cards. Each card represents a word beginning with the letter "L" or the letter "Q". Practice these sounds with your group. 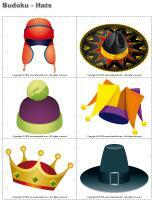 (Open perpetual calendar-Silly hats) Print and display to inform parents of the upcoming special day. Greeting: Wear a silly hat to greet children in the morning. Invite children to wear a hat they created with their parents (or one they made at daycare as part of an activity). Lunch: Invite children to choose a hat from your costume chest and let them wear it during lunch time. Naptime: Explain how Mexicans place their sombrero over their eyes to hide the sun during their "siesta". Let children place their hat over their eyes during naptime. Activities: Organize a variety of outdoor workshops which include hats as accessories. An obstacle course, a toss game, or a musical game all represent interesting options. Make original hats with your group and have children place them on their parent's head at the end of the day. (Open game-This is my spot-Hats) Print two copies of each card. Secure one copy of each card on the table using adhesive paper. Deposit the second copy in a bag. Children take turns picking a card which will determine their spot at the table for the day. You may also use the cards for naptime spots or for spots in the task train. (Open colourful hats) Print, laminate, and secure the illustrations on the floor to create a path leading to different areas within your daycare. The path can lead to areas frequently visited by children such as the bathroom, the cloakroom, etc. If you prefer, use the illustrations to delimit your various workshops. 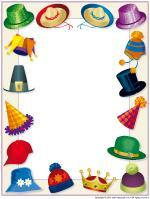 (Open educa-decorate-Hats) Print and laminate the illustrations. Glue them back to back on either side of ribbon or string. Hang your mobile form the ceiling over your changing table. Fill a bin with all kinds of hats and let babies explore! 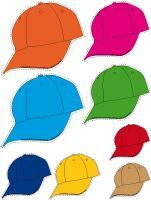 (Open colourful hats) Print several hats in basic colors. Stick them on the floor using adhesive paper. Invite babies to sit on a hat and name the color for them. (Open lacing-Hats) Print, laminate, and punch holes around the contour of the models. Children can thread string, ribbon, or a shoelace through the holes. Where does the hat go? (Open character-Hat) Print and display on a wall. Like pin the tail on the donkey, children must try to place the hat as close to the correct place as possible while blindfolded. Arrange a few short stakes in front of a predetermined toss line. Collect several different hats (or use children's hats). Children must toss the hats, attempting to make them land on top of a stake. Deposit 5-6 old hats on the ground in front of your group. Children must try to toss bean bags in the hats. If you wish, you may associate a certain number of points to each hat. Children sit in a circle. To the sound of a simple song or rhyme, they must deposit the hat on the head of the child sitting next to them. When the song ends, the child who has the hat on his head must sit in the centre of the circle and clap to encourage the other children. The game continues until there is only one child left. Variation: You may also choose to find other responsibilities for the excluded children in order to keep them busy during the game. (Open Sudoku-Hats) Print the grid and the cards. Cut out all the pieces and laminate them for durability. Children must place the cards on the grid while respecting traditional Sudoku rules: there mustn't be 2 identical cards in the same row or column. (Open educ-math-Hats) Print and laminate for durable, eco-friendly use. Children must count the objects and circle the correct number. (Open educ-shadows-Hats) Print and laminate for durable, eco-friendly use. Children must find the shadow which corresponds to each illustration and draw a line between the two using a dry-erase marker. 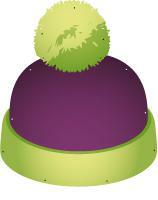 (Open educ-same and different-Hats) Print and laminate for durable, eco-friendly use. Children must circle the illustration which is different in each row. 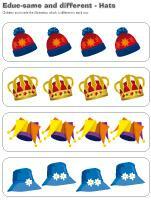 (Open colourful hats) Print and laminate the hats. 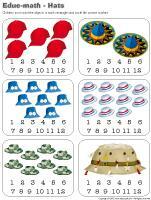 Encourage children to sort the hats by size, by color, or according to a pre-established order. (Open story and memory game-Hats) Print two copies and laminate the cards or glue them to the top of frozen juice cans. Place them face down on a table and encourage children to turn two at a time, attempting to find matching cards. Hang a mirror in your dress-up area (if there isn't already one). Add several different hats, necklaces, and accessories in order to make it possible for children to create original characters. If you have the chance, take pictures and display them in your dress-up area. Collect a variety of hats and helmets and let children manipulate them. Divide your table in two and ask children to sort the hats and helmets. Have them place the hard helmets and hats on one side of the table and the soft hats on the other side. Explain why some hats are very hard like construction hats or hockey helmets. Explain the importance of wearing a hat or helmet in certain situations (construction, sun, cold, etc.). Bake cupcakes with your group. Turn the cupcakes upside down. Spread frosting on the bottom of the cupcakes and stick a Graham cracker covered in chocolate on top. Add a small piece of liquorice to represent the tassel and enjoy! (Open puppets-Hats) Print the models on heavy paper. Have children cut them out and decorate the characters with arts & crafts materials. Attach a Popsicle stick behind each puppet. 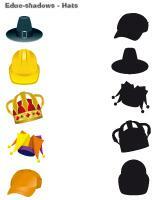 (Open models-Hats) Print several copies and let children choose the hat they prefer. Let them decorate their hat with a variety of arts & crafts materials (pompoms, glitter, confetti, scraps of paper, etc.). Display the hats around your entrance for the duration of the theme. Purchase paper plates and bowls. Cut a hole in the centre of each plate and glue the bottom of a bowl inside to create three-dimensional hats. Children can paint and decorate their hat as they wish. 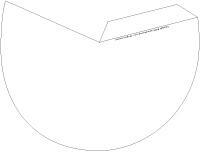 Cut out the centre of a paper plate, leaving a small border (a few centimetres). Let children decorate their crown with glitter glue, stickers, and other arts & crafts materials. Search for pictures of people wearing different types of hats in magazines and catalogues. Have children glue them on heavy cardboard and assemble them to form a book. Children will enjoy looking at their collective masterpiece in the reading area. Roll a large piece of construction paper to form a cone shape big enough to fit on a child's head and staple it. Let children decorate their hat as they wish. Don't forget to add a long piece of ribbon to the hat's tip. Find a painter's hat. They are usually available at the hardware store for a very low cost (you may even be able to get them for free). Children can decorate their painter's hat by painting directly on it or by gluing a variety of arts & crafts materials (pasta pieces, dried beans, etc.) on it. (Open king's and queen's crown) Print the model, trace it on cardboard, and cut it out. Wrap it in aluminum paper. Have children decorate their crown with shiny materials. Measure each child's head, adjust the circumference of the crown, and staple. (Open model-hat) Print, cut out the pieces, and staple. 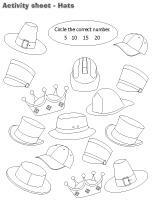 (Open creative coloring-Hats) Print for each child. Have children complete the picture. 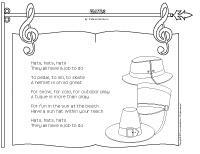 (Open coloring pages theme-Hats) Print for each child.